Sinuses are bony cavities which drain into and are ventilated through the nose via small openings called meatus (see below images of an endoscopic view and a CT scan). There are two maxillary sinuses located beneath the eyes and just above the teeth, two ethmoid sinuses located in between, two frontal sinuses located above and two sphenoid sinuses located behind the eyes. Except for the maxillary sinus, all other sinuses are very close to the eyes and the brain. The inside of the nose and the sinuses is lined by a mucous membrane called the mucosa. This mucosa is largely identical to the mucosa of the larynx and lungs, which explains why when trying to identify a sinus condition we systematically look for lung conditions as well (i.e. asthma). A detailed view of the anatomy of the nose and the sinuses. Acute rhinitis (the common cold) is often caused by a virus. Symptoms include a stuffy or runny nose. If the discharge turns yellowish or greenish it is a sign of bacterial infection. Usually symptoms disappear within a couple of days. Treatment is designed to improve breathing through the nose and decrease nasal secretions. Chronic rhinitis may cause symptoms that persist for several weeks or even months. Symptoms include stuffy nose, discharge and difficulty smelling. In case of allergy you may also have an itchy nose and watery eyes. 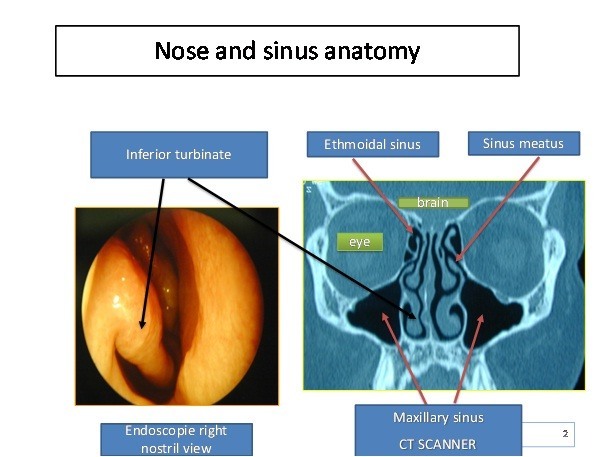 An ENT examination and endoscopy of the nose and sinuses is needed to confirm the diagnosis. Nasal blockage is caused by mucosal swelling, mostly of the turbinates. In 20 per cent of cases it is due to allergies. Treatment consists of rinsing the nose with a 0,9 per cent sodium chloride solution daily and applying cortisone nose sprays. Treatment duration can be several weeks or even months; it is very effective and does not have the side effects known to occur when taking oral cortisone. If treatment does not work and the nasal blockage is very uncomfortable, several surgical solutions are available. These procedures are done by endoscopy, which means they are minimally invasive and can be done under either local or general anesthesia. The goal is to reduce the size of the turbinates and improve nasal breathing. 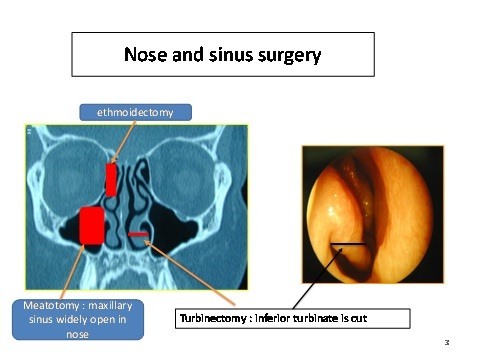 Several techniques are available which usually only require a one-day hospitalisation including cauterisation of the turbinates and partial resection of the inferior turbinate (called turbinectomy – image below). Several endoscopic surgery options are available to treat chronic nose and sinus issues. Sinusitis is an inflammation of the sinus mucosa; it can be acute or chronic. Acute sinusitis is very common. The symptoms include pain over the affected sinus, often accompanied by runny and stuffy nose on the same side. It is always caused by an infection. During the consultation your ENT doctor will perform an endoscopy of the nose. This is a very simple procedure and can help visualise pus at the sinus meatus level. An endoscopy usually suffices to make a diagnosis; in rare cases a CT scan may be necessary. It is important to rule out an infected tooth as the cause. Under antibiotic and nasal vasoconstrictor (otrivine) treatment, together with nasal rinsing, healing can usually be achieved within a couple of days. Seldom does acute sinusitis have complications involving the eyes or the brain. In such cases a CT scan or MRI, hospitalisation and surgical treatment by endoscopy may be necessary. Chronic sinusitis is recurrent or permanent sinusitis with symptoms of stuffy nose and decreased sense of smell. It is mostly caused by an inflammation of the sinus mucosa without infection. The condition is not painful unless there are complications. In 20 per cent of cases chronic sinusitis is associated with conditions affecting the mucosa of the respiratory tract, such as asthma. It is therefore necessary to identify and treat any such conditions. Other causes of chronic sinusitis may include polyps in the nose or sinuses. It is treated through daily nose rinsing with a solution of 0.9 per cent sodium chloride and the application of cortisone nose sprays. In 10 per cent of cases, endoscopic surgery under general anesthesia may be required to open the passage from the sinuses to the nose. These surgeries are named after the sinus they treat, and usually requite one day of hospitalisation. They are meatotomy (maxillary sinus surgery), ethmoidectomy (ethmoid sinus) and sphenoidotomy (sphenoid sinus). * Professor Pierre Verdalle is an ENT and Head & Neck Surgeon from France. He is part of the team of highly qualified French doctors who provide their expertise to the Hanoi French Hospital and all our patients. If you have any questions or concerns, please contact us at 84 – 24.3577.1100, access www.hfh.com.vn, or email us at contact@hfh.com.vn. Address: 1 Phương Mai, Đống Đa, Hà Nội.